Have you heard of Whole30? I first heard about it a few years ago when the book It Starts With Food came out. In essence, Whole30 is a chance to reset your body by eating squeaky clean for 30 days, giving you a chance to see if you have any latent food sensitivities, break any food addictions or unhealthy patterns you may have, clear up any food-related inflammation and start fresh. Well, it’s making a comeback. Several great bloggers are in the middle of theirs, so I’ve seen a huge resurgence of healthy recipes floating about the web. We aren’t on a Whole30, but we eat pretty darn clean most of the time. I’ve loved the huge variety of inspiration out there lately! 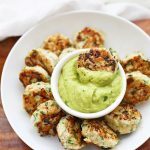 These Chicken Zucchini Poppers are delicious, and while they may be squeaky clean, they don’t skimp on flavor. First off: Michael H-A-T-E-S zucchini. Hates the texture, doesn’t like the flavor. BUT he loves these. Really loves them. Enough that he always asks when we can make them again. If you’re a zucchini hater, you should still give these a try! Grated, you don’t really get much of the squash texture, and they keep the meatballs nice and tender and juicy. So if you’re a zucchini hater, don’t hesitate to give these a try! We LOVE them. They’d make great game-day food for something lighter or a great addition to a buffet table. We love them for dinner with a little dish of guacamole or Citrus Avocado Sauce for dipping and some sweet potatoes or salad and fruit on the side. Not a guacamole fan? No problem. They’d be great with salsa or paleo ranch. If you’re not gluten free, they’d be awesome in a pita. (p.s. anyone have a good GF pita recipe? Don’t skip this step. Squeezing the liquid out of your zucchini is *really* important here. Why? Well, zucchini has a lot of moisture (which is one of the reason these poppers are so great), but if you don’t squeeze out some of that liquid, your meatballs/poppers will have a harder time sticking together and if you pan-fry them, you run the risk of them scorching and falling apart. Pan-Frying vs. Baking. My favorite way to make these is to pan-fry them. I’m not using a ton of oil here–just enough to cover the bottom of the pan. I use my cast-iron skillet for a really nice browning effect and keep the heat on the low end. That will allow the poppers to brown while still allowing enough time for the centers to cook. Baking is *really* convenient and fast, so I do that plenty as well. Do whichever works for you! Variations. This recipe is an awesome base recipe. Over the years, people have made it with pork, beef, turkey…even venison! Use your favorite. I also list the cumin here as optional. It gives these a tex-mex flavor that’s great with salsa, ranch, and guacamole. BUT. You can also easily swap the flavors by switching the cilantro for basil to give these a mediterranean vibe. They’re great with my favorite pasta sauce and noodles, or you can use parsley or dill for other flavor combinations! Can’t find ground chicken? Try this. I get ground chicken breast at Sprouts, but when it’s not in stock, I make my own by buying boneless skinless chicken breast (or thighs) and pulsing them in a food processor until it’s ground and no large pieces remain. It’s one extra step, but it works great! My MOST POPULAR RECIPE EVER! 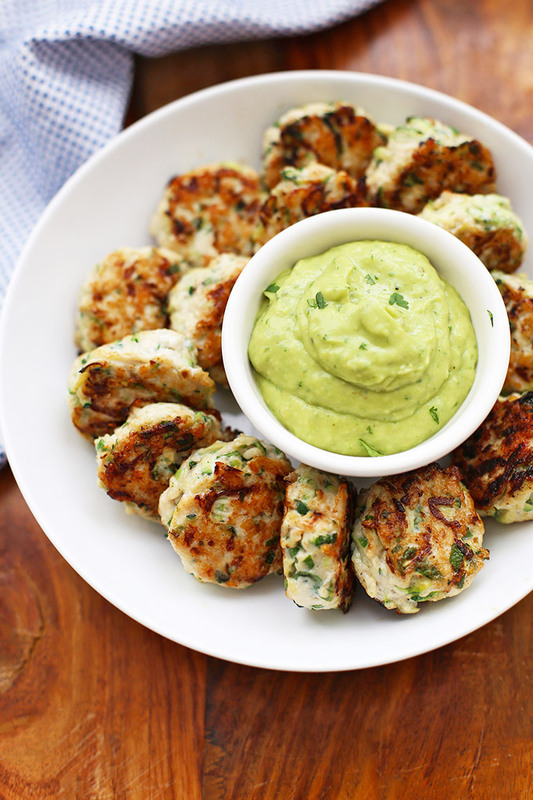 These chicken meatballs are squeaky clean, but not short on flavor! Gluten free, Paleo, and Whole30 friendly! CHICKEN: If you can’t find ground chicken breast, you can grind your own. Simply weight out 1 lb. chicken breast and pulse it in your food processor to “grind” until no large pieces remain. You can also easily substitute ground chicken thighs, ground turkey, ground pork, etc. Use what you like and what you can find! ZUCCHINI: Don’t be tempted to skip drying out your zucchini a bit with a paper/kitchen towel. Zucchini has a lot of moisture, and if you don’t squeeze it out beforehand, your meatballs may stick more to the pan if you’re pan-frying and have a bit more trouble holding together during baking. Just made these and they’re amazing!!! Taking them to a family party tomorrow and I KNOW they’ll be a hit! I tripled the recipe and everything turned out just fine! Made a whole bunch obviously:-) Any suggestions on freezing for the future?? Sure! I freeze them fully cooked. After they’ve cooked and cooled, I freeze them on a baking sheet lined with parchment or a silicone baking mat until they’re pretty solid, then transfer them to an airtight bag or glass container. That way, I can pull out exactly how many I want/need in the future (rather than them freezing in one giant clump!) So glad you enjoyed them! Hi Emily! I was wondering if you had suggestions on reheating? Thank you! Lauren – They microwave well, but my favorite is to toss them in the oven at 350 degrees for 10-15 minutes! I like to reheat any leftovers in the oven. I put leftovers in cold and let them heat up with the oven, normally my food is hot by the time the oven has heated up to 375* and of not I give it a few more minutes. Frozen foods I thaw overnight first. You say this feeds 4 to 5, but how many pieces does it actually make. I am going to take them to a party of 15people that will all be bringing appetizers to share? Karen – Depending on how big you make them, you can get around 20-24 per recipe. You may want to make a double batch for your party! My wife and I made these, only with our own guacamole recipe I’ve been using for years. Also we cooked whole grain brown rice(organic) and tossed the guacamole into the rice and served it cold as a side dish with the poppers. Dipped the poppers into the guacamole and my wife ate guacamole for the first time in here life and actually liked it! Yum, Thanks! WOW that sounds amazing! I’ll have to try that sometime! Thanks for the suggestion! Yum! I even have ground chicken in my freezer…I am adding this to my menu this week with the sweet potato not fries. Just wanted to say…so good! Made these tonight and really liked them – only one of my kids ate them but hey the others may come around at some point 🙂 I think next time I may try and Italian variation with marinara sauce. Oh Cynthia, thank you for the feedback! Sorry they weren’t a hit all around, but I’m glad you liked them! Liv – You can check the nutrition facts by clicking on the “recipe magic nutrition info” button right above the recipe. Hope that helps! I don’t see the nutrition info when I click the link? Does the nutrition facts apply to only 1 meatball or how many are in 1 serving? These sound so good Emily. I’ll have to see if I can get the rank and file to eat them. Lol. I always make my regular (turkey) meatballs with a ton of shredded zucchini and carrot in them and use oatmeal instead of breadcrumbs. They turn out fabulous. The kids love them and it’s nice to know that there is something good in there for them. I’m looking forward to giving these a try and seeing how it goes. I’m thinking of putting them in a sandwich with some marinara like a chicken parmesan sandwich. Do you have a recipe for your meatballs? I made these last night – (I did omit the cilantro because I am not a fan), but while I was cooking them (and the noodles for spaghetti- cause that was the direction i was headed) They smelled Asian-y to me -soooo I threw some carrots, and more zucchini in the pan tossed it all with teriyaki sauce and some cooked ramen noodles, and oh my gosh- newest quick healthy dinner plan. Yum!!! I’ll have to try that! Just stumbled upon your site!! 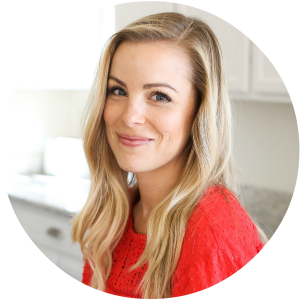 So excited to see a new blog that follows my proper eating habbits! Also if you are looking for a good GF blog, http://glutenfreeonashoestring.com/ is my lifesaver!! She has a book called baked bread and is a lifesaver for me! The ingredients are pricey to start, You use a whey protein isolate which contains some dairy) but once you have them pretty easy to maintain! Homemade bread is awesome! Can’t wait to keep exploring, and make these for dinner tomorrow night! Emily, these look fabulous. My husband hates any kind of vegetable except green beans. Would love to get him to eat these – will never tell him what’s inside. Any idea about the calories, fat, protein, etc. in this dish? Marjory – My husband HATES zucchini and loved these. Fingers crossed that your husband does too! As for the nutrition information, click the “recipe magic – get nutrition info” button right above the recipe and you’ll be taken to see it’s estimated nutrition facts. Happy eating! It says 204 calories per one serving. Is that only one popper per serving? If not, do you know how many would equal a serving? Brandi – The recipe nutrition facts were calculated based on 5 servings. The number of poppers per serving will depend on how many you make. If you made 25 poppers, there would be 5 poppers per serving. If you made 20, you’d have 4 per serving. Does that make sense? My husband hates turkey and he ate these. I did the recipe as written except for the ground turkey substitution. My nephew doesn’t love veggies, but he really liked these. I’m thinking of putting a paleo crust and calling it a nugget. It’s yummy and moist with no mystery ingredients. Thanks for the recipe. Em, these poppers are incredible!!!! They have so much flavor!!! Love love love!!!! So glad you liked them! I LOVE them! Erin – I haven’t tried freezing them, but I don’t know why they wouldn’t freeze well. Most meatball recipes I’ve tried do great in the freezer. If you do freeze them, please let me know how they work for you! I shall try it today and let you know… Looks so good, by the way! I remixed this recipe, I used ground turkey instead of chicken. Substituted cucumbers for jalapeños added feta cheese to the mix and pan fried small meat balls in olive oil until browned. Oh my goodness was it delicious paired with some tortellini’s and pasta sauce. Do you put A chicken breast in food processor and. Ground it?. Can’t find ground chicken breast. Or will ground turkey roll work? Cindy – I buy pre-ground chicken breast, but when I can’t find it, I just put a chicken breast in my food processor. Try not to puree it too much. You want there to still be some texture. If it’s too smooth, your meatballs might be too wet. If you prefer, you can use ground turkey. I just find ground turkey to have a stronger flavor. Great thanks really do not like ground turkey. So course ground or fine chicken? Cindy – I like mine pretty fine. Just be careful not to puree it so long that it becomes a paste, if that makes sense. Best of luck! These look delicious, but I will have to substitute the chicken with something vegetarian. My question is why does it say 21 day diet? Micki – That diet isn’t associated with my blog. This recipe was featured on the 21 Day Sugar Detox’s Pinterest page, so that’s probably where that came from. Hope that helps! May I ask what the nutritional value is? Laura – Sure! Just click on the “Recipe Magic – Get Nutritional Info” button right before the text of the recipe. Hope that helps! Just made these and they’re almost gone! So yummy 🙂 I also love that the nutritional info is provided but wanted to ask …how many poppers would you consider a “serving”? I used a cookie scooper and was able to get 33 meatballs. Thanks! Great! I’m so glad you liked them. I made slightly bigger meatballs (I get between 20-25 each time), so for me, I divide that among 4-5 people. Each person gets 4-5 meatballs. My husband is a bigger eater than me and the kids, so it depends on what you like. The whole recipe is designed to feed 4-5 people, so I’d just divide the meatballs (6-8 meatballs per person). Hope that helps! It does not give you a calorie content where could we find that? Kristi – If you click on the pink and grey “Magic get Nutrition Info” button right above the recipe, you’ll see the nutrition content. Several people have also imported the recipe into MyFitnessPal. Hope that helps! Can you bake these instead of frying??? Karen – I have no problem cooking them in olive oil or avocado oil, but if you prefer baking them, I’m sure you could. I don’t have a time or temperature for you, since I’ve never baked them. If you do try baking them, I’d love to know what you think! We tried both baking & in the pan. From the first batch, my husband felt the pan ones had more flavor. I liked the slight char from the baked ones, but felt 400° a bit too much or the time too long—and I only baked for 20 min… then tried the broil on low for maybe a minute. It was too much. Finished the bowl by cooking in the pan. By the last batch, my husband said they tasted the very best of all of them—he could taste all the flavors. Yummy. We used guacamole and salsa and ate all of it between the two of us. Yes, we are stuffed. ? Recipe completed as written with the 3/4 tsp of cumin. You are right! I can’t imagine anyone recognizing the zuchini—it is not noticeable at all. SunnySky – THANK YOU for such a thorough and thoughtful review! I’m so glad you enjoyed them and found a method you liked best. Happy New Year! Hi, wondering if you have nutrition with no oil? I know some bloggers can easily change the nutritional info by changing an ingrediant. I’m wondering if baking with Pam, no oil would drastically drop the fat count. Heather – I’m sorry, I don’t. You can try any of the free online nutrition estimators (I like My Fitness Pal) to get a good estimate without the oil. Best of luck! I used a muffin tin and baked them at 400 degrees for 20 minutes. They came out perfect, not dry at all. I recommend using a little cooking spray on the bottom of each tin to keep them from sticking. I actually prefer the baked version to the fried one but they were both good! I added a little chopped mushrooms to mine because I like mushrooms. Lovely! I’m so glad you shared this. I have a mini muffin tin and had thought about trying them this way. Thank you so much for the feedback! Ok.. So my husband (Mr. Meat and Potatoes man) and my 16 month Son (very picky eater) Love these. I could not cook them fast enough. They were on the floor in the living room popping them back and playing and coloring on the floor… *(however, I can get them veggies in them works for me). I LOVED THEM! a small salad with them and we were good to go! Thank you for sharing! May I ask a somewhat stupid question…. does one skin/peel the zucchini prior to grating, or just grate it whole? Brian – Not a stupid question at all! I keep the skin on. If it bothers you, you’re welcome to peel it. I think it’s pretty, and most of the nutrition is in the skin. I am going to try these with turkey burger since that is what I have plenty of , Wondering if baking these would be better for us then frying them in a pan of oil. Baking would reduce the fat content, but will change the texture somewhat. I don’t worry about cooking with healthy oils. These meatballs are not deep fried, and if you use a nonstick pan (cast iron, enameled, etc) you don’t need much oil at all! I wish you all the best trying the recipe! Hi – I have tried these twice and LOVE them. I baked them both times, but my challenge is that despite putting olive oil on the pan, they stick and even burn a little. Should I try a different oil on the pan? Does it have anything to do with the heat point (or whatever that is) with olive oil? Both times I served these I was asked for the recipe – it’s a hit! Glynis – I almost always bake them these days. I line the baking sheet with foil, drizzle it with oil, and rub it all over. For some reason, they seem not to stick with the foil, at least for me. I hope this helps! Grapeseed oil has a much higher smoke point and doesn’t add flavor as does olive oil. I use a nonstick pan. Thanks for the tip Jean! Have a great day! Do you wring out the extra moisture from the grated zucchini? Paula – Nope! I don’t wring any extra moisture out. I find they end up with a gorgeous texture this way. Ooh. Im thinking some ground lamb fresh oregano and a Greek yogurt dipping sauce! Do we peel the zucchini first before grating? Michelle – I keep the peel on. Hope that helps! I saw these on a shared link on FB and I knew I had to try them! I made them per ingredients listed. As for the cooking the only thing I did different was I browned them for about 3 mins on each side. Then I baked them in a Pyrex for about 20 mins on 350. They were perfect! Not dried out at all like I feared they would be. They were crispy on the outside and nicely moist on the inside. These are Delicious! A huge hit here at my house in GA. Thank you for this recipe! YUM! I’ll have to try the brown-then-bake method sometime. SO glad you liked them!!! They don’t have ground chicken here in Panama. Can you use ground beef instead? They don’t have zucchini here very often for that matter — if you find it, it is imported. I will have to stock up next time I see some at the store, and then shred it and freeze it. Rebecca – I haven’t tried the recipe with ground beef. I think you could try it. If you have access to chicken and a food processor, you can make it yourself. I pulse the chicken until it’s pretty finely ground, but not a puree. It works great! I hope you’re able to find what you need! I tried these today and only had ground pork on hand. And they were delicious! ! My picky toddler gobbled them down. I dipped them in guacamole and had some sauteed squash and zucchini on the side YUM! Oh, yay! I’m so glad! Any one try cooking these in coconut oil? Major problem with this recipe… I made it to take to a friend’s house for a potluck – and I’m realllllly struggling not to just sit down and pig out on these! SOOOO good! made some minor changes – but don’t we all? These are a new favorite – please let me know if the other commenter ever gave you feedback on how well they freeze – because if they freeze well I’m making a double-batch just for that purpose! THANKS! The nutrition info states 4-5 servings, which would appear to be more “patty” sized, like your second two photos. Any idea how many small poppers (as pictured in the first photo) this makes? Diana – I’ve been able to get about 20-25 poppers out of the recipe. The 4-5 servings is 4-5 poppers per person. Hope that helps! Thanks Eileen! I’ll be sure to link up! I’m so glad you linked up. You were the reader favorite, and I’m featuring your recipe at this week’s roundtable, which just went live tonight. If you have any other AIP recipes, please feel free to join us again. I host the roundtable every week. I just made these last night from the roundtable link, and they were FABULOUS! My husband hates zucchini, and DEVOURED these, as did I. I used parsley instead of cilantro because that’s what I had on hand, and I did use cumin which was absolutely delicious. Making again – maybe even today!! Also – I used chicken thighs that I ground up in the food processor. Worked really well. So great! I’m glad you liked these, and I’m SO glad you tried making your own ground chicken. Awesome! This is the best new recipe that I’ve made in a long time. Yum, yum, yum. They were a lot juicier than I expected. I’ll definitely be making this again. Emily, you asked about a good GF pita recipe. Try myheartbeets.com . She has some amazing recipes. I just made her 3 Ingredient Paleo Naan, which I am sure you could use as pita. It was good. Although I really like it warm, I did eat some cold and it was ok. Thanks for this recipe. Will try it asap. Always looking for clean food recipes for this big family. Should you make and freeze prior to cooking or after cooking. I would like to prep them today, because will be working the rest of the week. So try to get things prepared when have a minute to spare and not at 8 when I get home from work and kids activities. Dana – I’d fully cook them and then freeze them. That way, you just need to thaw them, heat and eat! I hope you like them! I doubled the recipe, made them into burger sized patties, pan fried each side, then baked to finish. They were delicious! Thanks for sharing your recipe! I’ll definitely be making this again. Oh, I’m SO SO GLAD! That’s great! I wish you many more happy successes in the future! These are delicious! This is the second time I have made them using ground turkey and this time I made a double batch so that I can freeze a few (that is if I don’t eat them all first). The first time I made these I served them to my non Paleo family and they loved them. I topped them with quacamole but I also love to eat them cold and plain. Thank you for this recipe, it is a keeper!! Baked mine in convection oven @ 350 for 30min, perfect! Yummy of course! Oh yay! I’m glad they worked out for you! Dinner was a big hit tonight! I substituted ground turkey for the ground chicken and served these with salsa and guacamole. The kids said that we need to have this every week. I told them if they were really good to me maybe these would show up in their lunch boxes. We’ll see! Kelly – Yay! That’s so great to hear! They would make SUCH great lunches! I made these and they were great! I do have one suggestion though. I think you should add that the zucchini should be squeezed in a cloth after grating it to remove some of the excess moisture. Mine were so wet that I had to add bread crumbs. Luckily I’m not on paleo yet, so it was fine, but next time that’s what I’m going to do. Thanks for sharing this recipe. Cheers! Christy – Thanks for your feedback, and sorry you had some trouble! In my experience, they’re wet going into the pan, but the excess liquid cooks out while they’re cooking. I never squeeze out my zucchini. Maybe anyone that has the same problem will find some help in your solution, though. Thank you for sharing! Awesome~ I made these this evening for my husband and I with squash and corn on the cob. Great flavor, they really need nothing to dip them in. I thought for sure my husband would wrinkle his nose at the turkey factor (didn’t have ground chicken), but they smelled so good, neither of us could wait to dig in. Bonus there was enough left to add to the left over spaghetti squash for two lunches this week! Lucky me! I also have a zucchini hating husband who likes these poppers. I have made them several times and love the recipe. Several times I have packed them to take with me when I am out and about and have eaten them cold and love them that way too. Thanks for a great recipe! Made them tonight with ground turkey served over Fettuccine & Alfredo…DELICIOUS!!! Made these tonight with turkey mince (since it was what I had in the fridge). Served with home made low carb blue cheese dressing. Was delicious! We substituted basil instead of cilantro and ground turkey instead of chicken. Yum!! I hit for my family! David – Yep! Just click on the “Get Nutritional Info” link right above the recipe. Made these for dinner tonight exactly as written and they were a success! I found that two (large/soup) spoons worked well for scooping them into the pan. I could use the spoons to shape them into neat rounds and tidy up any trailing strands of zucchini. I started out with a regular (non-non-stick) skillet liberally coated with coconut oil but found that even after allowing them to brown quite well, they really stuck to the pan, so I switched to a non-stick pan for the rest. With sides of guacamole, roasted cubed sweet potatoes, and roasted kale these made a great dinner! I made these last night. They were wonderful! I’m so glad you liked them! Thank you for the feedback! I made these today and they taste great but mine were boiling in zucchini juice for a long time before they started frying . Otherwise they were very good . These I’m going to make next Thursday (sorry – already got everything planned in until then). Her naan bread is wonderful too! 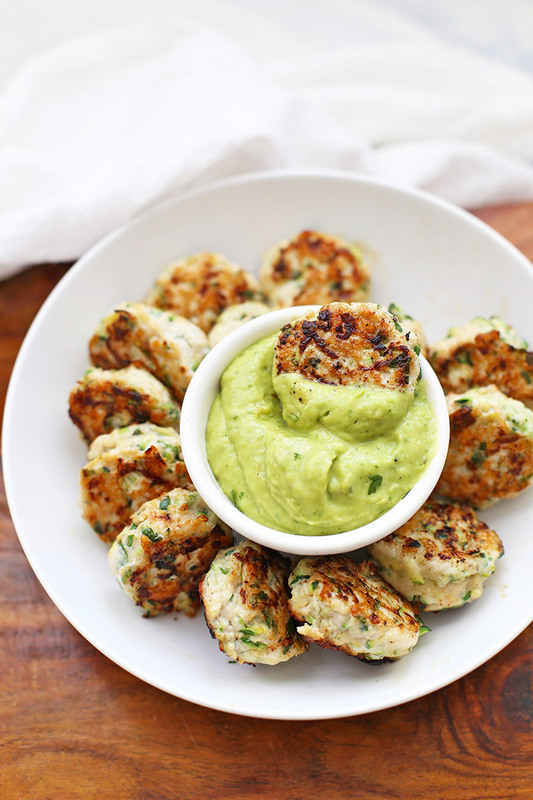 OMG dipping these into avocado/guac…. AWWW YEAAA! 🙂 Heavennn! Emily, these were such a hit! I can’t get Jake to eat any vegetables except starches and he LOVED these. We need to find the right recipe to dip them in but they are so good! them today. Is the shredded chicken already cooked or raw? Sarah – It’s raw ground chicken, not shredded. Hope you love them! I made these today, but used lean ground turkey instead of chicken. I used my vegetti tool and made zucchini noodles, then diced those up. I also used pizza seasoning, a little finely diced red pepper and some grated parmesan cheese. I fried mine in a little olive oil, which is a little messy, but love the crisp outside and juicy inside. They were quick and easy to make and turned out delicious! I got 25 poppers out of mine. I have home canned chicken breast. Gonna try these using egg as a binder. Any other suggestions? Patty – I’m not sure how well canned chicken will hold together. I think the egg will help, but I’m not really sure how it’ll go. I’d love to hear how they turn out! Wow! This is my favorite whole30 recipe yet!!!!! I didn’t have ground chicken, so I cubed the chicken and stir-fried it; it was unbelievable! Thx for the recipe! Should I mix everything in a mixer? Or how do I treat the chicken to be able to mix it with the other ingredients…? Dorothee– No problem! So, you’re using ground chicken (or chicken mince). To “toss” you’re really just going to stir with a fork to combine the ingredients. No need to use a food processor or mixer. I hope that helps! If you have more questions, don’t hesitate to ask! I made these tonight (substituting turkey for the ground chicken) with a really good guacamole. My husband ate these stopping between bites to say how good they were! He is on a restricted diet (no diary or wheat) and it’s been very difficult finding good recipes that are relatively easy. This was a hit! Thank you so much for sharing! Haley – I’m SO glad! That’s great! Courtnie – I’m so glad you liked them! They’re the BEST! 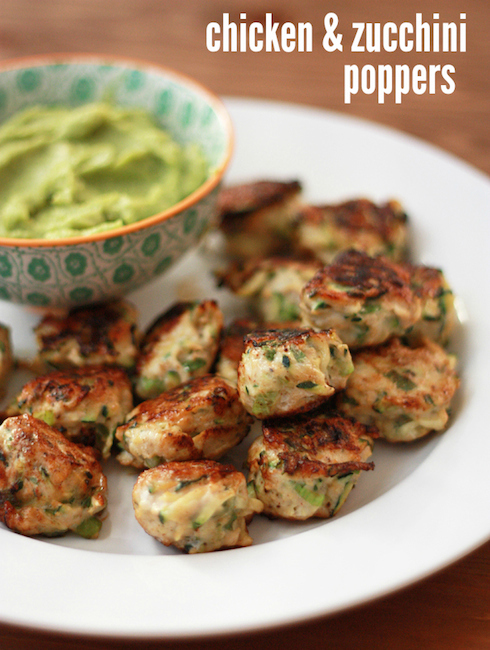 These Paleo poppers are perfect! They’re so good, I’ve decided to include them in my list of Top 10 Paleo Appetizers! Thank you for such a wonderful creation! Love this recipe and the comments that everyone ELSE loves it. I can’t wait to try them. One question: The little “meatballs’ look like they’ve been flattened a bit. Almost like a mini patty. Am I looking at the picture correctly? Does this happen through cooking? Do you flatten them a bit in the pan while cooking? I can’t wait to make them! Kimberly – They do sometimes flatten a bit when you cook them in a pan. If I’m baking them, the underside of the meatball gets a bit flat sometimes, too. If you want them quite round, I’ve found that refrigerating or even freezing the formed meatballs before cooking them helps them retain their shape. Hope that helps! Fantastic! Just showed my hubby the recipe and he’s excited to have them tonight. Thank you so much! I absolutely adore this recipe, I saw the post just yesterday on pinterest, and i couldnt wait to get home and make some. I used the exact same recipe, just added some more zucchini because im trying to eat healther, the only thing is that it was late night and i had no avocados at home, and i am a lazy donkey and i didnt want to go to the store. So instead i served them with buffalo wing sauce, and blue chesse on the side. Those were the BEST boneless EVER! I also made mashed cauliflower with butter and garlic as a side dish, so I was able to get rid of the carbs, and had an amazing dinner. Oh WOW! Buffalo sauce sounds like SUCH a great spin! We’ll have to try that. I cant wait to try more of your recipes! I had just started the Whole30 and needed a dish for a potluck! I didn’t have ground chicken, so I used ground turkey and baked them. They were delicious! People didn’t even know they were eating healthy until I told them! Will definitely make them again. Oh no! I’m so sorry they fell apart on you. How did the mini muffin pan go? I made these last night for dinner and had them again for lunch. They are totally awesome! I used ground turkey because I had it on hand and also shredded up a medium carrot because I got excited about it haha. I served them with strawberries and homemade chips and salsa. I will definitely be making these again soon! I’m thinking about trying to freeze some for lunches during the semester… we’ll see if it works out. Thanks for such a great recipe! Yum! I freeze them all the time and they work out great. Hope you have the same results! I’m so glad! That’s great! Delicious! Made these tonight. Just used chicken, zucchini and adobo- nothing else.. Baked them and ooh lala- delicioso. It’s a keeper of a recipe, thanks so much. I made these for dinner last night and oh. my. heavens. They were delicious! Who knew that doing the Whole 30 could taste so good? I wonder how these stack up on calories. I’m trying to log them into my fitness pal app and it seems with the word “popper” the app thinks these are deep fried. You can import the recipe to My Fitness Pal, or you can click on the “Magic – Get Nutrition Info” directly above the recipe for the nutrition facts. Hope that helps! What good is this recipe without the nutritional facts? Joe G – The nutritional facts are available by clicking the pink and white “My Recipe Magic – Get Nutritional Info” button immediately above the recipe. You can also plug the ingredients in (or import the recipe) to My Fitness Pal. Hope that helps! Emily, I’m sorry if someone has asked this already – But, did you press the grated zucchini before mixing it with the chicken? I usually have problems using zuchs in recipes because it will make them too wet. Love this recipe & can’t wait to try it. Thanks for sharing it! I didn’t the first dozen times I made the recipe. Someone mentioned their poppers were too wet with the zucchini, so I started patting mine dry a bit with paper towels before mixing them in. It does seem to work a bit better. In my experience, there’s no need to completely wring them out with a dishtowel before proceeding with the recipe. I hope that helps! I made these last night and I absolutely love them!!! I drizzled Greek yogurt and added a little bit of Trader Joes jalapeño pepper hot sauce! Huge hit with the fiancé. Thanks for sharing such awesome recipes. Liz – I’m so glad you liked them! Hooray! I just bought a Tupperware food grinder kast month, by mistake. Teaches me to order things when I’m seriously ill with the flu and pneumonia. Anyway, I was going to return it until I saw this recipe. ( I’ve lived here in the Netherlands for 14 years and have never seen ground chicken.) I’m so glad I kept because it us going to get used tons just for this recipe! These were so easy to make abd absolutely delicious! I’m so glad you liked them! What lovely feedback, and I think you win the prize for the furthest reader to have tried them! Nikki – Congrats on your Whole30! I do not think mashed potatoes would work well in this recipe. Your texture would assuredly be different, and I think the flavor combination would be off. I’m sorry I don’t have a better vegetarian suggestion! I made a version of these for my kids for lunch….I was trying to use up some leftover chicken. I shredded the cooked chicken finely in a blender, and added an egg to bind. Otherwise, I followed the recipe, cooking in a pan with some fat skimmed off a pot of chicken broth…we are mostly GAPS, so we don’t mind the fat 😉 I served them with homemade sour cream thinned with sauerkraut juice (mayo/sk juice for my df kid). I didn’t find the texture amazing (due to the chicken being precooked, but I was kind of expecting that…. ), but my kids really liked them, particularly my 18 month old…he had FIVE of them (there were 13 in the pan, so they weren’t super tiny). I am keeping this recipe to use again, maybe one time here I will have some ground chicken to use, even! Thanks! These look amazing! I’m going to whip up a batch or two for snacking during March Madness and for easy lunches for work (if they last that long). I could also see adding Italian seasonings (basil, oregano) and serving with a nice marinara sauce. They are delicious! however, I added a bit of egg to bind them together otherwise they fell apart…. also a tad of cream cheese takes it to another level. This is on the menu tonight! Excited to try it out. Holy cow these are great!! These are so easy to make. I cook them in my Forman for 3 1/2 minutes and BOOM… Done! Thank you so much!! These are truly amazing! I’ve made them 4 or 5 times now! For me, the cumin is not optional…..it is a must! I found a jalapeño yogurt dipping sauce from Costco that compliments them beautifully! Thank you for sharing such a great recipe! Would ground pork work as well? Sherralee – I haven’t made them with pork, but a few readers have with good results! For those have tried baking, I find mine stick to the baking sheet, even with oil on it. Any suggestions? Lower temp, longer cooking time? Different oil than olive? Thanks. Get some of the Reynolds non-stick foil and line your baking sheet with it. The stuff is magic. I made them tonight with the avocado citrus dip! Put it all on top of a salad with salsa, craisins, hearts of Palm, tomatoes, pumpkin seeds, and roasted red peppers! Amazing! Wow, this has been a popular post for you, it seems. 🙂 And so it should be; these are delicious. I am not a cilantro fan, but I put chopped jalapenos in mine instead. 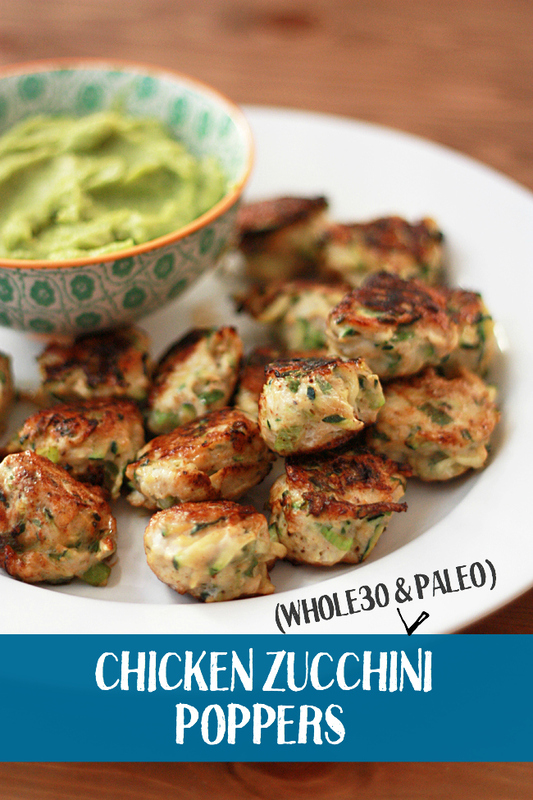 These are quite the crowd-pleaser, even among people who do not like zucchini. This is rare indeed. Thanks! Looks so good. Can’t wait to try your recipe. Just made these for dinner, served with salsa, guacamole (my very first one EVER), sour cream, and coleslaw, and got resoundingly favourable feedback. My 10 year old son gave them “two thumbs up, × 10!! !” Methinks this recipe is a keeper! Thank you!! Oh yay! I’m so glad you loved them! Oh my yum! I cannot wait to try these! Low carb and so healthy. I bet they would be good with shirataki noodles. Thank you! Thanks for this recipe! I didn’t have any ground chicken, but I had some leftover grilled chicken breasts in the fridge. I pulsed the chicken very finely in the food processor, and it worked just fine! I didn’t cook them as long as the recipe says since the chicken was already cooked. I’m on the autoimmune paleo diet, and sometimes it feels like there’s just nothing left I can eat; this was different and tasty! Making these right now and boy does my house smell good. My husband and I have already tasted a popper from the first batch and it is so tasty! I am hopeful that if people file enough copyright complaints with Facebook, the page will get taken down. I tried the suggested basil/garlic version. Very tasty. After first batch though, added an egg to mixture so they would bind better. First batch a bit crumbly. Great recipe. I took these in an Italian direction… omitted the cilantro and cumin; made 15 golf ball sized meatballs, seared them on my grill pan on top of the stove then finished them in a pot of simple tomato marinara. Served over spaghetti squash with roasted green beans on the side. I will absolutely use this recipe again. Thanks for sharing such a simple and adaptable recipe! That sounds AMAZING! I’ll have to try them in the marinara. Tried making these today (with cumin) and i was blown away how good it was! Cooked a bunch for lunch at work too. Had a friend try it and loved it! Really great recipe! Thanks for sharing. I’m so glad you liked them, Mark! They’re a favorite at our house too! Thank you for these, I found this recipe on Pinterest and I think it is an instant classic – one that we will put into frequent rotation. Thank you! We made it with the cumin and loved how fresh the flavors all were together. Yum, yum, yummy. So delicious we didn’t have time to miss any of the things we aren’t eating. Ground Turkey as an alternative to ground chicken… Ever tried that? Jules – I don’t care for ground turkey, so I haven’t tried it but plenty of readers have and have had great results. I’m making these but with a twist I’m going to turn them into pot stickers without the wrap and fill with traditional carrots, cabbage, garlic and dip with coconut aminos. We love these! I found the recipe during our Whole 30 and it’s stayed in the rotation now that we’re mostly paleo. Recently, I’ve been making them with dill instead of cilantro, and dipping them in tzatziki sauce. (Well, fake tzatziki – paleo mayo with cucumber and dill.) I follow the directions to bake them since I couldn’t keep them from falling apart when frying. That’s on me though – I struggle with fritters, latkes and the like too. I made these with ground turkey and omitted the cilantro (my husband doesn’t like it, unfortunately!). They are surprisingly delicious! I expected them to be good, but not such little flavor balls! I sent them with my husband for breakfast (Whole30) and he texted me telling me how good they were. We’ve been eating them straight out of the fridge for a snack. So, thank you for the recipe! Yum! I’m so glad you liked them! I always have to make a double batch these days because we go through them so fast! Have you tried making these with ground beef? We bought a quarter of a cow this year and I need some great ground beef recipes! Lots of readers have made them with beef (and pork and turkey) and everyone has reported that it works out great for them! You’ll probably want to be sure to wring out some of the water from the zucchini before you make them since beef is slightly fattier, but it should work great! 10/10 from the family and double batch next time. I didn’t have green onions and replaced it with leek, the combination with zucchini works a treat. Thank you for recipe Emily. So. so glad you liked them! I always have to make a double batch too, now! Can I cook these on the oven instead of frying ? Thank you! Katherine – Yep! We do it all the time. You’ll see I’ve written in directions for baking in the post. These are awesome! I left out the cilantro and served them with spagetti squash and marinara. Husband and son loved them too! Baking method was perfect! Side note- for some reason it’s not letting me click the stars but 5 Stars for sure! Oh, I’m so glad you liked them! THANK YOU! These are so simple yet delicious! So far I’ve mixed chicken and zucchini in salads and it tastes great, so these meatballs must be amazing!!! ~a bit on the dry side. Hubby totally enjoyed. Nice recipe for leftover turkey. Esther – Glad your husband enjoyed them! They will be much less dry when made with raw turkey or chicken. Cooked turkey (or chicken) will yield a more dry result since so much of the moisture is already removed. Hope that helps! Delicious recipe. Added grated carrots and ginger as well and we polished it off in minutes. Thank you for this idea! Emily, these turned out great!! I didn’t use cilantro, not a fan, but I did add cayenne pepper to half of the mixture what a great spin!! Thank you for the recipe. Oh, I’m so glad! I’ve had lots of readers try other herbs (parsley, basil, etc.) if you ever need to change things up in the future. I know not everyone is a cilantro fan! These were a hit with the kids, but I had to peel the zucchini first as the youngest is put off by any “green stuff”. I totally get it! Glad they were a hit! Made them tonight and think they need more salt and flavor. Kinda bland. Laura – Sorry they were bland for you! I’ve found the cilantro and cumin keep things flavorful enough for me. Maybe more salt and increased spices for you next time might help. Sounds like that will be just the ticket for you! Love these! Do you have any tips for freezing leftovers? Chelsea – Sure! I lay them flat on a plate or pan in the freezer for about 10-15 minutes, then I transfer them to an airtight container or zip-top bag to store in the freezer. The first 10-15 minutes helps them get solid enough not to freeze in one giant blob in the freezer. You can skip that step if you want, but I never do. That way I can pull out just as many as I want instead of the giant block! I did not have good luck with cooking these on the stove top. I had the burner on medium-high and the first batch burned. With each bunch I lowered the heat but they still burned with even lessening the time on each side. The last bunch I had the temperature on 3 which is just above simmer. What can I do to make them correctly? Oh, no! I’m so sorry that happened for you. Occasionally, I’ve had a reader say that when this happens for them they’ve found that squeezing out every last bit of moisture they can from the zucchini before putting it into the meat mixture helps solve the problem. Another thing would be to make sure you have enough oil in the pan (though I’m sure you already tried that). If you want to be sure to avoid the burning altogether, you can bake them. I bake them more often than not these days, since it’s a little more convenient for me. You can pop them under the broiler for the last minute or two to get some of that browning. I hope that helps! I’m so sorry they didn’t turn out for you! Just wondering if yellow squash could be substituted for zucchini? Yes, absolutely! The one caveat would be if the yellow squash has thick skin. If it’s fairly thin, you won’t have any trouble. If the skin is thick, you’ll likely want to peel it to avoid having any unpleasant chewy bits in the poppers. Hope that helps! I substituted the cilantro (just not a fan) for basil and it was delicious! Thanks! Oh, I’m so glad you enjoyed them! I love hearing that! THANK YOU for such a kind, lovely comment. You made my day! made these for the first time just now and…WOW! So Good!!! grated the onions and cilantro along with the zucchini in the food processor to save a couple of steps and squeezed out as much liquid as i could before adding chicken and spices. these would be great with tazikki too! thanks so much for the great recipe!!! A food processor makes this such an easy dinner, doesn’t it? I’m so glad you enjoyed them! Here’s to many happy meals in the future! I made these for my family last night…BIG hit and so tasty…WOW! Is all I can say and no processed sauces etc. so great! Thank you so much! I now make these once a week. My favorite!!! Thanks for the recipe. It wouldn’t let me select 5 stars tho!!!! I’m so glad to hear you love them! They’re one of my all-time favorites! These were awesome. I leave out the onions & garlic because I can’t have them. I also halved the salt and pepper because it was way too much the first time around. COULD YOU BAKE THESE IN A MINI MUFFIN PAN? Sandy – I have never baked them in a muffin pan, so I don’t think I could advise you well regarding cooking times. I do bake them on a cookie sheet lined with foil (I use a cookie scoop to scoop them into little “meatballs” on the baking sheet). You’ll see baking directions in the recipe, but I don’t have muffin pan baking times, I’m sorry. If you try them this way, I’d love to hear how they turned out! these little babies are IN.CRED.I.BLE!!! i made them a few months back and have thought of them often since. time to make them again. perfect to have in one’s whole30 arsenal. super YUM!!! I’m glad to hear it Annalea! Thank you! 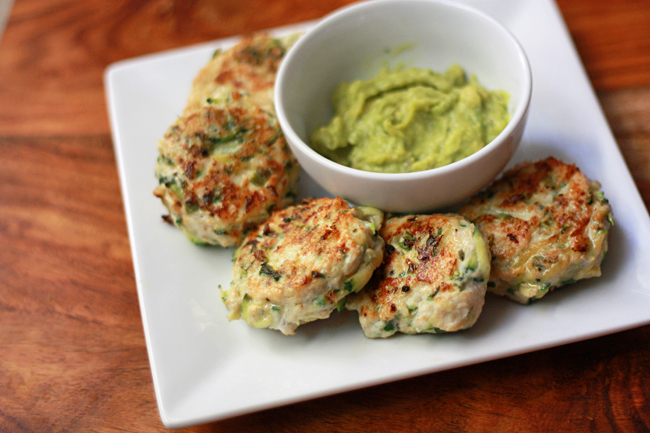 Made these tonight into larger patties … so yummy and a great hit with the family! The mix was a bit wet so added a little flour. Highly recommend it though! Just made these, they are as good as they look! The cilantro really offsets the other ingredients, I love them. And the lime gives just enough of a kick to the dip . Easy, quick, and delicious. Thank you so much! I’m so glad you enjoyed them! We have them on repeat all year long! I did not have ground chicken on hand tonight but I did have chicken sausage. I omitted the salt added flax seed meal and almond meal and they are delicious! You had me at cilantro and cumin! BTW, my family is gluten free, and I have been making my own pita flatbreads for about a year using an all purpose flour mixture that I got from the cookbook Cooking for Isaiah by Silvana Nardone. She was editor in chief for Every Day with Rachael Ray, and it doesn’t hurt that she owned an Italian bakery in Brooklyn. I’ve used this flour mixture for about 3 years now in everything from pitas to carrotcake cupcakes, chocolate chip cookies, and homemade noodles. No one can tell the difference. My daughter took carrotcake cupcakes to work for a potluck,knowing that one of her coworkers was newly diagnosed with celiacs. No one believed her either. Namaste makes a pizza crust that is GF, and the moment you open the package, you smell the herbs.. it’s like a Tuscan crust that even our non gluten free friends devour! Looking forward to making these with guacamole, marinara, may be tzatziki? I just left the info on the GF flour mixture and pitas, and GF pizza crust as your original post asked for a GF pita, we’ve been on the GF quest for five years now, and can’t imagine going back. I guess we’re clean eaters, but all of us have decided if we can’t pronounce it, it doesn’t go in our bodies. It has served us well. That sounds amazing! I can’t wait to look up the flour mixture! I love love love these !! They are so good I can eat a whole batch by myself! So easy and healthy!! Great alternative to standard meatballs. I have lots of patients who don’t like ground beef for a number of reasons, I bet they would love this! I bet they would too! These are THE most popular recipe on my blog! These sound amazing and I will definitely be making these as soon as I can get to the market! My question is: how do they not fall apart without the use of binding agents such as bread crumbs and egg? Thanks again! I love your site and have subscribed! Loreen – Great question! It’s the zucchini! Be sure to squeeze out any extra liquid and then it helps bind everything together. We’ve made these loads of times and love them! Can straight neck yellow squash be substituted for zucchini? Yes! So long as it’s thin-skinned and you follow the steps of getting out as much moisture as possible. I love these! Have made them several times and my toddler likes them too. I’m having baby#2 soon and wanting to make some freezer meals and think these would be great to have on hand. Any recommendations for freezing? Bake then freeze (microwave to heat up), or freeze as patties and then bake from frozen? Congratulations on Baby #2! These are a great freezer meal. I cook them completely then freeze them for 30-45 minutes on a baking sheet (or plate) lined with parchment paper. This will allow them to harden without sticking to each other. Then, transfer them to a freezer bag or airtight container, and you can pull out as many or as few as you like! I’m doing a Whole30 and made these Sunday and LOVE them! So do my family – they ate all of the ones I had in the refrigerator so I had to pull out some of the ones I had frozen to take for dinner yesterday to work. I doubled the recipe and did 3 cups of shredded zucchini and one cup of shredded carrot. I didn’t have to squeeze out the liquid from the zucchini doing it that way – the carrot seemed to help soak it up! I also used regular yellow onion that I sauteed for a little while in olive oil first (my husband hates raw onion). Last night I ate them with some homemade marinara sauce and they were AMAZING! I will definitely be making these again! I’m so glad to hear you enjoyed them Melody! You made my day! I Made these today for my family and they were amazing ! looking forward to more recipes I will try from this site ! thank you . I’m so glad you enjoyed them Anja! I hope you find many more recipes here that work for your family! I totally tuck them into marinara sometimes or with teriyaki sauce. They’re SO good! Made these last night and we all LOVED them!!! We made them with ground turkey because it was what we had. We’ll try them with chicken next time. We have been looking for a way to eat more guacamole, and this was perfect! All six of us have been doing Whole30, and on our Day 20, we were definitely grateful for such a fantastic recipe! Thanks so much! This is now a favorite. Forgot to give it our rating – definitely a 5-star!!! These were amazing, eapecially with some Wholky Guacamole! YUMMY!!! So excited to try this recipe! I love to make meatballs (I bake them in a mini muffin tin which is amazingly easy to make enough for the freezer). I am trying to expose my step kids to healthy foods but get a turned up nose when it comes to veggies. Love hiding them in recipes that they love then having them help me make them to discover that they have been eating them! Sometimes we need to be sneaky! Exactly! I love to be transparent, but sometimes, a little sneakiness is just what’s needed ? Yum! I’m so glad you enjoyed them. I’ve made them so many different ways over the years, and every way is delicious! These were really delicious! I loved the cilantro and mine only took 20 minutes in the oven. I used 2 large zucchini and only pressed out a little water. I loved how they didn’t need an egg or breadcrumbs at all. They didn’t stick to the pan and were so easy to make! I may add chopped jalapeño or lime juice next time but this recipe is perfect. I served it with sweet potatoes and peas but they are so versatile, you could serve them lots of ways! Great recipe! I’m SO GLAD you enjoyed them Crissy!!! 2c grated zucchini ..is that 2 cups? Rosa – yes. 2 c = 2 cups grated zucchini. Oh, I’m so glad to hear that Jill! You made my day! HA! I totally get it. I haven’t ever made them as meatloaf (so I’m not sure if it’d dry out with the added cook time), but I’ve done it as burgers (divide the mixture into 4-6 patties) and it goes really quickly! My 13 year old daughter loved these!! Great recipe! So glad to hear that! They’re always a hit at our house! I love this recipe! I was thinking about using the recipe but instead of meatballs I was thinking chicken burgers. Have you tried grilling the chicken on a bbq? Made these, and my husband loved, LOVED them. Asked when we were having them again. Amy – I’m so glad to hear that. Thank you!!! What a pleasure to try something new and have a huge hit. Fantastic recipe- these pair well as described with the avocado sauce or as others have noted, with Asian flavors- but they are also good straight up with a salad. Thanks for sharing a great recipe. 5 stars from me!! Gina – What a happy comment to get today! Thank you so much! I’m so glad you enjoyed them. Happy Sunday! These are the most amazing flavor and simplest recipe ever. I actually added an extra cup of zucchini and my son who is only 11 ask me all the time to make this. It is the PERFECT combination of veggies and protein in one bite. It is now a weekly standard at our home. Oh, I’m SO glad to hear that! THANK YOU For sharing! Came across this recipe and can’t wait to try it! Do you think these could be grilled if they were made into burger size? question — do I need to squeeze some of the water out of the grated zucchini before I add to other ingredients?? I plan to cook this morning for tonight’s dinner and I can’t wait to try these little poppers. Judi – Yes! That’ll give you the best results. These are great! Very easy to make and very delicious. I pulsed chicken breast and thighs in a blender to make my own ground chicken. I also added 1 egg and peeled the zucchini since the skin was too tough. I made these even more fun by adding 1/3 cup Frank’s hot sauce and omitting the cilantro to make these Buffalo Chicken Zucchini Poppers. I baked for 22 minutes, then broiled for 10 minutes. Thank you for a great and tasty idea to use up that fresh zucchini from the garden! I’m so glad to hear that you enjoyed them! I LOVE your Buffalo twist! I’ll have to try that! love these!!! my go to! So glad to hear that Jessica! Thank you for sharing!!! Natalie – I haven’t used dried cilantro, but typically with dried herbs you use 1/3 the amount (so 1 tsp dried for every Tbsp fresh). Hope that helps! I used ground venison in place of ground chicken (solely because we have a lot of venison on hand) & they turned out amazing! So good! My family is not a fan of meatballs, but all we digging in to these. Great recipe! SO so glad you enjoyed them! Is it 2 cups zucchini after you wring it out or before? Kathy – I’ve never tried it! (I don’t have one) If you give it a go, I’d love to know how they turn out! What can I substitute the meat for a vegan? Franny – Honestly, you’ll just need to go with a different recipe. This is a chicken meatball recipe that uses zucchini as a filler, so there really isn’t a vegan substitute. 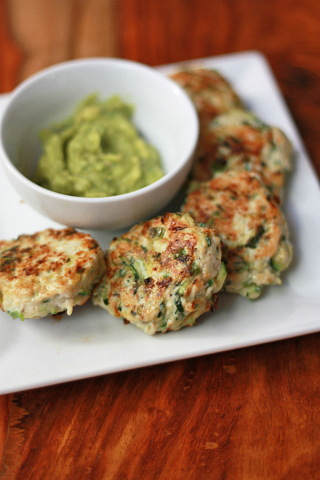 You might like these Vegan Zucchini Fritters from my blogging friend Jessica, though! My teen age daughter is practicing her nascent kitchen skills and found this recipe for us to try. So easy, so healthy and SO GOOD!! Thank you! Plus, that Citrus Avocado dipping sauce is out of this world! I think I could just eat it on toast! Oh, I’m so glad you liked it! I agree about that avocado sauce. I seriously put it on EVERYTHING!!! Hi What is the green dip made of? I’ve made this recipe so many times; always a crowd pleaser, especially for my picky little boys. Oh, I’m SO GLAD! Thank you so much for sharing this with me! I’m so glad! They’re one of our all-time favorites! Would I be able to substitute yellow squash for The zucchini? I am new to eating clean and just made these for the first time. I have pretty decent sized balls, for me it’s about 2-3 bites, and got 24 on the sheet with mixture leftover. It’s quite yummy before cooking it, so I’m thinking throw it onto some GF bread or something. I should have a few left to freeze for another time. Thank you so much for all of your amazing ideas, I can’t wait to try more of them! I enjoy these so much. In the “Nutrition” section, it says 13g of Fat; is this mostly from the oil used during frying/baking? I am new to eating clean and just made these for the first time. Several people have made them in the air fryer and posted pics! They look amazing! I don’t have one, so I’m sorry I can’t give you a suggested cook time. I made these this weekend! I baked them, flipping halfway through and used the broiler for just a minute. Didn’t use the cilantro, not a fan, and did use the cumin. Huge hit with everyone. I was the only one in the house doing Whole30 and had to fight my way through to get a couple. YAY! I love hearing this!!! So yummy! Doubled recipe and ate the extra for lunch through the week. Will definitely make again! Thanks for the recipe! Have you or anyone you know used an air fryer to make this? I’m curious! Thanks!! I haven’t, but that sounds like a great option! (I believe another reader has tried it, but I’m not sure about how long/settings, etc.) If you give it a try, I’d LOVE to know how it goes! Hi, I pinned this recipe but it was removed due to copyright issues. Do you not allow users to pin your recipes on Pinterest? Angela – I’m sorry for any confusion! I LOVE when readers pin and share my recipes. It’s my favorite! In this case, there were several websites using that particular photo and pretending like it was theirs. To remove the stolen content from Pinterest, they had to remove all instances of that particular photo. That shouldn’t happen again! Thanks Emily! I love your recipes!